The Prado today presented the methods and results of the technical study and restoration that the Museum has recently carried out on its copy of La Gioconda. The painting has been in the Museum’s collection since its foundation, having previously been in the Spanish royal collections. The recently completed project, which was initiated two years ago and is sponsored by Fundación Iberdrola, Protector Sponsor of the Museum’s Restoration Programme, has revealed that the painting was executed at the same time as Leonardo’s original portrait now in the Musée du Louvre and that it is the oldest copy of it, in addition to being the most important version of La Gioconda known to date. The results of this new study, which principally derive from a comparison of the two works and from a study of the technical documentation obtained during this project, are of real importance for the history of art in that they allow for a better understanding of the original painting and for an appreciation of details in it that had not been previously noticed or fully understood. The Prado’s copy of La Gioconda was formerly in the Spanish royal collection although it is not known when or how it arrived. The painting has been the subject of a technical study and restoration process that was requested two years ago by the Louvre in relation to the inclusion of the painting in the exhibition opening at that museum this March entitled L’ultime chef-d’oeuvre de Léonard de Vinci, la Sainte Anne (29 March to 25 June 2012). This project, which has involved the recuperation of the original appearance of the Prado’s painting, means that this copy is now one of the most important sources of information for working procedures in Leonardo’s studio, given that it is now considered to be by one of his pupils or assistants who worked on it in the studio while Leonardo was painting his original. For this reason the Prado’s panel is now considered the most important version known to date of Leonardo’s celebrated painting in the Louvre. An initial comparison of infra-red reflectographs of the two paintings yielded results of such interest that it was decided to examine the Prado’s painting in more depth and to proceed to its restoration. The technical study undertaken followed the Prado’s normal procedures and involved infra-red reflectography, x-radiography, ultra-violent induced visible fluorescence and examination under binocular magnifier. One of the most important discoveries arising from these analyses, and which again supports the conclusions of the present study - undertaken with the aim of determining how the work was painted and its state of preservation – was the fact that the Prado version is painted on a walnut panel. This wood is used for other small-format panels by Leonardo and his studio, including The Lady with the Ermine, La Belle Ferronière and Saint John the Baptist. In addition, it was revealed that the painting does not have a traditional gesso preparatory layer, but rather a double one of lead white and linseed oil. Although unusual, this type of ground appears in numerous works by Leonardo and his studio. Infra-red reflectography and examination of the pictorial surface under raking light showed the existence of a landscape beneath the black background. Chemical tests concluded that this background was an area of later repainting dating from no earlier than 1750 and that there was an organic layer between it and the landscape underneath that had preserved the latter in excellent condition. Despite the difference in the quality of the painting in the two works, the landscape in the Prado version reflects the colours and evanescent forms of Leonardo’s landscapes. The enormous interest of this copy lies in the fact that from the under-drawing to the final layers it repeats the working method used to create La Gioconda without aiming to be a forgery of it. A comparative analysis of the infra-red reflectographs of the original in the Louvre and the Prado copy reveal identical details beneath the pictorial surface that point to a parallel process of creation. The figures are practically the same in size and shape and, more importantly, each of the corrections to the under-drawing in the original are repeated in the Prado version. They include the alteration to the shape of the waist, the position of the fingers and the outline of the veil and of the head. There are also lesser modifications including slight changes to the form of the cheeks and neck. The results of this study thus point to a member of Leonardo’s studio and to the fact that the two works were painted in parallel. With regard to a possible attribution, the pictorial style is not comparable to those of pupils or followers of Leonardo such as Boltraffio, Marco d’Oggiono or Ambrogio de Predis, who had very defined artistic personalities. However, the work can be stylistically located in a Milanese context close to Salaï (1480-1524) or possibly Francesco Melzi (1493-1572/73), who were Leonardo’s most trusted pupils and who inherited his work. In addition, the extremely high quality of the materials used in the creation of the Madrid version suggests that it was an important commission, unlike other known copies of La Gioconda, which are all later and clearly reproduce what was by then a famous original. Technical analysis has demonstrated that the Prado version was executed in parallel to the original, giving rise to the hypothesis of a “workshop duplicate”, executed at the same time and with direct access to Leonardo’s gradual process of execution. After analysing the information derived from the technical study, the Prado proceeded to restore the pictorial surface, removing oxidised varnishes that had given the painting a yellowish hue, particularly in the flesh tones. This procedure restored the original tonalities as well as the volumes of the materials and the transparent effects of the veil. After cleaning was completed the Museum’s restorers removed the black layer of over-painting that completely covered the background. This was carried out gradually using organic dissolvents until this layer was completely removed. Once the landscape had reappeared and in order to obtain the correct transition between the figure and the background, re-establishing unity and balance between them, repainting over the veil and part of the hair on the left side of the head was also removed. This functioned to recover the transparency of the veil and the view of the landscape through it. This particularly important zone of the painting thus regained its original, ethereal quality and conveyed a much better sense of the air and space surrounding the head. Given the very good state of the painting, only a small amount of chromatic reintegration was required in the final phase of restoration and was limited to small, insignificant losses. The technical study of the Prado’s painting was undertaken by Ana González Mozo, researcher in the Museum’s Technical Documentation Section, in collaboration with the different areas within the Restoration Department. Restoration was carried out by Almudena Sánchez Martín, restorer at the Museo del Prado. The project was coordinated by Miguel Falomir Faus, Head of the Department of Italian Painting (up to 1700) at the Museo del Prado. The painting has been in the Prado’s collection since the foundation of the Museum in 1819. It was previously in the Spanish royal collection, which provided the nucleus of the Museum’s holdings. While it is not known exactly when or how it entered the royal collection, it is probably the painting listed in 1666 in the inventory of the Galería de Mediodía in the Alcázar as a female portrait by Leonardo. Miguel Falomir Faus, Head of the Department of Italian Painting (up to 1700) at the Museo del Prado, considers it very possible that this copy was already in Spain in the early years of the 17th century. Normally on display at the Museum until its removal to the restoration studio in June 2011, the painting was previously catalogued as an anonymous copy from the first quarter of the 16th century painted on poplar panel. 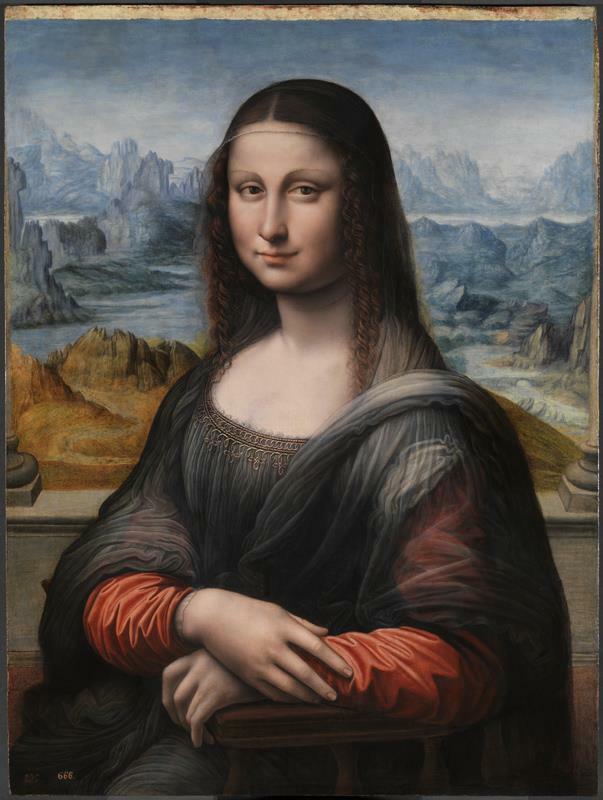 As a result of the new information that has emerged from its recent study and restoration, the painting can now be catalogued as “La Gioconda, studio of Leonardo da Vinci, ca.1503-16. Oil on walnut panel”.